Quite simply tasting as good as it looks, Cornflower Flower Petals Tea is a truly delightful brew boasting notably floral flavours and truly enchanting aromas. The petals are commonly added to certain black tea blends, including our very own Earl Grey with Cornflowers. However, this particular beverage is, in fact, a wonderfully nutritious herbal tea. It is likewise as practical as it is pretty, and can be consumed on a daily basis for its amazing health benefits. There are many different types of cornflower, and petal colours can range from pink, white, to blue. However, it is only the latter that offers medicinal qualities, and the latter is, in fact, the cornflower we use in Cornflower Flower Petals Tea. When consumed as part of a healthy and active lifestyle, Cornflower Tea can provide strong anti-bacterial, anti-fungal, anti-inflammatory and diuretic properties, as well as relief from urinary tract infections, and even treatment of minor eczema! The Centaurea cyanus plant has been known by many different, and equally fascinating names, including hurt sickle, bluebottle, bachelor’s button, boutonniere flower, and cyani flower. It’s Latin name, meanwhile, has two stories associated with its creation. The term ‘Centaurea’ was named after the ancient Greek Centaur, Chiron, who taught mankind the healing virtue of herbs. ‘Cyanus’, on the other hand, was allegedly adopted in honour of a youthful and unwavering devotee of the Roman goddess, Flora, whose name was Cyanus. According to legend, her favourite flower was the cornflower. It is an astringent, herbaceous plant belonging to the Asteraceae family, and can grow to heights between 30-75 centimetres (12-30 inches). Cornflower produces narrow, lance shaped, greyish-green leaves and flowers atop of the hairy, multi-branched stem. Originally native to Europe, cornflowers have since been found growing in great abundance across much of North America and Australia. It often flourishes as a weed in crops of wheat and rye, and can sometimes be found on roadsides, hills, and some plain regions. The flowers typically bloom between the summer months of July and August. When it comes to harvesting for its use in herbal teas, these flowers are often artificially dried in temperatures of 35C (95F). 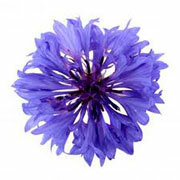 Cornflowers have been added to anything from salads to garnishes, and even tea! Since the end of the Great War (1914-1918), they have also been associated with remembrance in France. The ‘Bleuet de France’, as it is known, is now a symbol of memory for, and solidarity with, veterans, victims of war, widows, and orphans. It depicts a single cornflower, and can be worn as a badge of remembrance, similar to the British poppy. As much of northern France found itself completely demolished by the chaos of war at the time of the November 1918 Armistice, the cornflower - along with the poppy - thrived throughout the horrifically war-torn landscapes of ‘no-man’s-land’. Today, it is not only a symbol of peace in the world, but also a symbol of peace in the mind. Drinking Cornflower Flower Petals Tea after a long, hard day is the perfect calming remedy, and is also supported by modern science! To find out more information, please see our Health Benefits section below. How to Serve: So beautifully subtle in flavour, any additions would likely overpower this beverage. Instead, the Kent and Sussex Tea and Coffee Company recommend that this herbal tisane is best served as it is. Tasting Notes: ‘Delicate’ is an especially befitting word for this brew. Delicate in flavour; delicate in aroma; Cornflower Flower Petals Tea is likewise notably sweet and floral, leaving a delicious and refreshing aftertaste. Health Benefits: While Culpeper’s early findings may not hold as much weight in this day and age, his incredible legacy has since seen cornflower and cornflower tea subjected to rigorous scientific testing. It is now known that Cornflower Flower Petal Tea contains high concentrations in many vitamins, minerals, and other organic compounds, including Vitamin C, and folic acid. This beverage is an excellent choice for improving immune system and skin health, as well as providing relief in minor depression and anxiety sufferers.